Art Circle Gallery celebrates its 25th year and takes a look back on its rich history as a key player in the Philippine art scene. Art Circle was established in 1991, when it operated independently from Heritage Art Center. At the onset, Art Circle’s vision is single-minded: to bring the very best of Philippine art. Over the years, the gallery has grown an extensive and eclectic collection of artists – from timeless masters, contemporary artists, to aspiring fresh talent. After cultivating a diverse artistic portfolio, Art Circle sought to expand its reaches to a growing clientele. With its main gallery located at the Shangri-la Plaza Mall, Art Circle Gallery currently has nine (9) operating branches in key areas across Metro Manila. 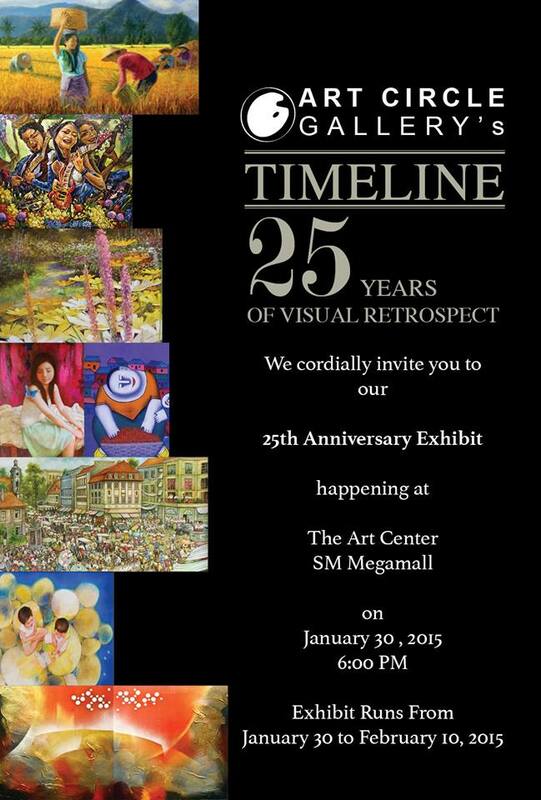 On its 25th anniversary, Art Circle Gallery unveils its commemorative art exhibition, “Timeline: 25 Years of Visual Retrospect”. The exhibit features a panoramic view of the Art Circle Gallery portfolio over the course of its 25-year history. This ambitious undertaking is a showcase of the gallery’s finest collection of art and brings together its repertoire of stellar artists and mavens of the genre. Leading this artistic ensemble are the pioneers who continue to be part of the gallery’s main collection: Manuel Baldemor, Nestor Leynes, Larry Memije, Noel Mahilum, Jeff Dizon, and Blaine San Luis, among many others. Between them are seminal works and valuable contributions to their respective genre, as well as the cumulative expertise and mastery of their craft. Also included in the gallery’s resumé are established artists, contemporaries to the masters, who have earned their place and niche in the art scene: Joel Mahilum, Lito Barcelona, Nell Campos, Anton Mahilum, Raul Patindol, Eberle Catampongan, to name a few. Lastly, the exhibit also looks to the future, as shown by its up-and-coming artistic mavericks: Monnar Baldemor, Alwinder Sarmiento, Oliver Marquez, Erwin Mallari, and Jun Caingat, among others. After 25 years, Art Circle Gallery has come a long way from its humble beginnings as a quaint art shop in a quiet corner along Roces Avenue. To this day, Art Circle Gallery continues to be the country’s leading authority in the Philippine art scene. Bringing the best in Philippine art has never been more resounding and relevant in recent years.